Sh. Deepak Panda and Sh. Ghanshyam Padhi of Denkanal, Odisha, progressive farmers, have been cultivating mango in more than 30 hectares of area. Most of their plantations are under high density (400 - 800 plants/ha). For last three years they were not getting desired yield in spite of proper orchard management. 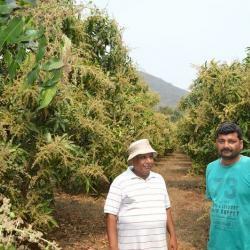 They told that they were growing different mango varieties like Amrapali, Langra, Alphonso, Dashehari, Banganapalli, Kesar, Himsagar, Mallika, etc., they could harvest 6-7 tonnes of mango per hectare and could earn about Rs. 80000-90000/ha in initial years, but the situation had changed from last three years as yield and profitability reduced by more than 50%. They realized that poor flowering, canopy overcrowding, high fruit drop and high incidence of pests and diseases were responsible for substantial yield reduction (3-4t/ha). During this period the CHES Bhubaneswar got approval from competent authority to conduct field experiment at farmers’ field. As such two progressive farmers namely Sh. Deepak Panda and Sh. Ghanshyam Padhi from Denkanal were selected and following interventions were taken up at their fields. Canopy of the overlapping unproductive trees were suitably reduced by pruning, centre opening and removal of unwanted branches during July-August in order to ensure better light penetration and its distribution inside the canopy. Application of optimized dose of paclobutrazol (0.25 a. i./m canopy spread) was made through collar drench in September – October to induce flowering. Nutrient management through optimized dose of macro and micronutrients, plant protection measures including use of fruit fly trap and management of fruit drop with the application of auxin and pest management were made. These interventions were implemented under the supervision of CHES, Bhubaneswar. The impact of interventions was evident from next year onwards with the significant increase in flowering intensity (80-85%), yield (10-12 t/ha), profitability (Rs. 1.40- 1.50 lakhs/ha) and significant reduction in pest and disease incidence. They harnessed the benefit of yield increase and early fruit maturing potential of Dashehari (4th week of April to 2nd week of May), Langra (2nd – 3rd week of May) and Amraplali (3rd – 4th week of May) and earned remunerative return by selling their produce in Delhi market through SAFAL and NAFED. They have not only sold their produce at remunerative price but also opened new market channels for other mango growers. Now their farms are considered as reference farms for other mango growers. Considering the impact of interventions, the technology has been adopted by more than 40 mango growers covering about 100ha for enhancing mango yield under high density planting system (HDPS) in the region.